Information for women and the parents of babies who are patients at the Royal Women’s Hospital at Sandringham. We want to make sure you are safe and well cared for during your time with us. If you have any questions or concerns you should ask your nurse or midwife for help. For further information about your care at the Women’s, or information about your condition see other pages on this website. You can download the information on this page as a PDF. You can also telephone the Women’s Welcome Centre. The centre, based at Parkville, is open during normal business hours (9.00am to 5.00pm Monday to Friday). Getting to the Women's at Sandringham. The Women’s at Sandringham is at 193 Bluff Road Sandringham (Melway reference 76 K12). Accessibility: Wheelchair access is available at the hospital’s main entrance. Taxis: There is Taxi Phone located in the main reception. Passengers can request to be picked up from the main entrance. Buses: Link route 600 and the Moorabbin Transit bus route 825 pass the hospital. Visitor car parking: The car park is open 24 hours a day 7 days a week. Car parking fees are displayed at the entrance. Ticketed parking can be paid for at machines located at the main hospital entrance and at the entrance to Outpatients. There is some short term (30 minutes) street parking available in front of the hospital. Check signs for restrictions. Trains: To Sandringham Station. From there, catch the 600 bus to the hospital. For further information regarding train, tram and bus information, and timetables call 1800 800 007 or visit the Public Transport Victoria website. For the location of main services and facilities download a map of Sandringham. Are you or your baby becoming unwell? Visitors are welcome at the Women’s. For the comfort, health and safety of our patients, we ask visitors to respect our visiting hours. If your family, friends or carers feel ill, have an infection or have recently been unwell, ask them not to visit until they have fully recovered. Visiting hours (general): 3.00pm to 8.00pm. Partners and siblings are welcome from 8.00am to 12.30pm and 3.00pm to 8.00pm. Alternative visiting hours may be negotiated with the nurse-in-charge in special circumstances. Visiting hours for parents are unrestricted. To help provide a quiet and safe environment for all babies, we ask that no more than three people (including the baby’s parents) are at a baby’s bedside at any one time. Family and friends (including children) may visit babies in special care according to the wishes of the parents. Written permission from the parents is required for family members or friends to visit in the absence of parents. No visitors during rest time: 12.30pm to 3.00pm. If your first language is not English and you would like help talking with the health professionals who are caring for you, the Women’s can arrange for an interpreter to assist you. You can request an interpreter, including an Auslan interpreter, when you are arranging your stay on the ward. You can also ask your midwife or nurse if you would like an interpreter. Your family and friends may want to know how you are during your stay with us. For maternity enquiries, please nominate one family member to contact Maternity Reception, (03) 9076 1233. For all other patient enquiries please contact Main Reception, (03) 9076 1000. Visitors’ toilets are located near the main reception desk on entering the hospital. Sandringham Hospital’s kiosk is open daily from 11.00am to 7.00pm and is staffed by volunteers. The kiosk sells food and drinks, magazines, hand-knitted garments, cards, confectionery and various toiletry items. A cafeteria can also be found on Level 1. Its opening hours are 9.00am to 7.30pm. Meals are available for lunch and dinner with snacks provided at other times. Please tell the meal staff if you have any allergies or specific dietary requirements. We advise that a minimal amount of money be kept with you and that your valuables should be sent home if possible. If this is not possible, please keep any valuable items with you at all times. You’re welcome to film or record in the hospital when it is safe and appropriate to do so. However, there are times when taking photographs, filming or recording can affect your care, breach the privacy of other patients or breach the privacy of Women’s staff members. You don’t need permission to photograph, film or record yourself or a loved one while in the hospital as long as you don’t photograph, film or record a member of staff or any other patient or visitor. This includes capturing the voice or image of anyone nearby. You can photograph, film or record clinical care – such as the birth of a baby – if you have the permission of all staff members involved in the clinical care. You must stop photographing, filming or recording at the request of clinical staff at any time. We ask that any material featuring a member of the Women’s staff is not posted online or on any form of social media (Facebook, Instagram, Twitter etc.) without their permission. Ask a staff member if you are uncertain when it is appropriate to take a photo, film or record. An external company provides the patient telephone and television service. Daily, weekly and monthly rental rates are available and are payable in advance. For telephone or television rentals, speak to a representative or staff on the ward. Patients must be signed up for this service to receive bedside phone calls. You are able to use your mobile phone while you are in the hospital, although please maintain a distance of one metre from any medical equipment. Please be considerate of others when using your mobile phone or tablet. Payphones are available on the ground and first floors. WiFi access is not available. Your bedside console has a number of functions. 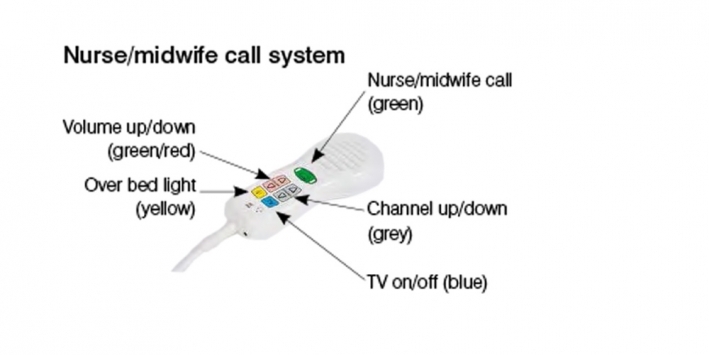 It allows you to call the nurse or midwife, control the TV and has a speaker for the TV and radio. Your nurse or midwife will explain how to use it and other call devices located throughout your room. Please be considerate of fellow patients when you are watching or listening to the TV or radio. The Women’s is committed to ensuring your safety. To assist with this, we need to know who you are. To make sure you or your baby are safe and receiving the correct treatment, procedures/tests and medications, we will check your identity many times. Ensure staff check you or your baby’s identity and any allergies you may have before you or your baby are given any medicines. Let us know if any of you or your baby’s personal details on the consent form are incorrect or have changed. Make sure you know who you or your baby’s nurse/midwife is for each shift. All staff should be wearing an identification badge. If you are not sure who someone is, please ask. Ask to see and read your consent form before your treatment/procedure. Make sure the surgery, procedure or treatment you or your baby are having is explained to you and is what your agreed to. If there is a mistake, please point this out and ask for a new consent form to be completed and signed. If you would like an interpreter, please ask for one. If something does not look right, or you hear something that is wrong, please let us know immediately. During your stay in hospital you are likely to see a number of different staff including doctors, midwives, nurses, pharmacists and allied health professionals. All of these people are responsible for your care and need to be kept up-to-date about your condition and your treatment. This sharing of your health information is called clinical handover. You are an important part of this process and you will be involved in the handover of your care at your bedside. Family and partners are welcome to participate as well, but if you would prefer them not to be present, please let staff know on your arrival or before handover. If you would prefer not to have your care discussed at the bedside, please let the staff know. If anything discussed is incorrect or you don’t understand, please let us know and ask us to explain. for an interpreter if English is your second language. At the Women’s your health information is stored as a computer file and as a paper file and is accessible to all the health professionals involved in your care. staff can give you appropriate treatment. know what information is in your medical record. Information about your stay and treatment is provided to your local doctor to continue your healthcare. Medicines are an important part of your treatment. When you’re admitted to hospital we will ask you what medicines you take. Knowing about your medicines will help us make the right decisions about your health. It can also help us to prevent mistakes. Over-the-counter medicines, vitamins and natural therapies are just as important to mention as prescription medicines. Please tell us what you take and what works for you – your experience is important. any other drugs or substances. Bring all of your medicines to hospital with you. Keep an up-to-date list of your medicines and show it to staff when you’re admitted. Ask for an updated list of your medicines before you go home. This list will be helpful for your local doctor and pharmacist. Tell us if you’ve had allergies or bad reactions to medicines in the past. While you’re in hospital, don’t be afraid to ask what medicines you’re receiving and why. Your hospital pharmacist will work with your doctors to ensure medicines prescribed are appropriate and safe to use. If you are discharged and require medicines, you will receive information about that medicine. Pharmacy hours: Monday to Friday 8.30am to 5.00pm. Discharge medicines will be issued with an invoice that can be paid by EFT or by phone once you are at home. Please show staff your current Medicare card, plus any other concession cards, such as pension or health care card, DVA card, Safety Net entitlement card from your local pharmacy. Any patient admitted to hospital may have a risk of getting an infection, either through invasive procedures or because of their illness. Hospital staff employ many strategies to reduce this risk. Patients and visitors also have a role in preventing infection in hospitals. The best way to prevent infection is to perform ‘hand hygiene’. You can clean your hands with soap and water if they are dirty or soiled or use an alcohol-based hand rub on visibly clean hands. before and after touching a dressing. not to touch your dressings, drips or other equipment around your bed. A blood transfusion is the transfer of blood from one person to another. In rare cases you may need a transfusion while you’re in hospital because of your condition or because of the treatment you are receiving. Before consenting to a blood transfusion, ask why you need a transfusion and what the benefits and risks are for you. If you don’t understand why a blood transfusion is necessary, don’t be afraid to ask questions or for more information. Australia has an extremely safe blood supply. All donated blood is tested for blood-borne diseases like HIV, hepatitis and syphilis. The risk of contracting any type of infection from a blood transfusion is very low. Very rarely, severe reactions can be life-threatening. Remember to tell your doctor if you have ever had a reaction to a blood transfusion. So that your blood transfusion can be given as safely as possible there are strict procedures staff must take before every transfusion. Every time you have blood taken for matching you will be asked for your first name, family name and date of birth. Your armband will also be checked. Before your transfusion, staff will check your identity again, as well as the unit of blood. If you feel that you are becoming unwell or you notice your baby is getting sick, tell a member of staff immediately or ring the nurse/midwife call bell. If there is no response within 10 minutes and you are still feeling unwell or concerned about your health or your baby’s health, phone 1800 901 445. A senior staff member will respond and assess you. If you are a visitor and you notice a patient’s health is getting worse please tell a member of staff. is not taking any notice of loud noises, a bright light shone in their eyes or a gentle pinch on the arm. Vomit is not clear or not milk or lemon-coloured. recover more quickly and perhaps leave hospital sooner. It is very important to us that your pain is well controlled. A range of health care professionals may work with you to control your pain. They include nurses, midwives, doctors, pharmacists and physiotherapists. You are also important in the management of your pain. Only you know what you are feeling and so you are the best person to decide if you need more pain relieving medicines. Letting your nurse, midwife or doctor know when you have pain will allow them to work out what is causing your pain and choose the best form of pain relief. There are several methods that can be used for rating or describing your pain. Scoring your pain between 1 and 10. No pain is scored as 0 and the worst pain you could ever imagine is 10. Rating your pain as either no pain, mild pain, moderate pain, severe pain. Describing the type of pain you have. Some words for pain include sharp; hot; stinging; cramping; dull; burning; tingly; numb; shooting; stabbing; aching; throbbing. There are a variety of ways you may be given pain relief. Tablets or capsules are the most common way of giving pain medicine and should be effective within 15 to 45 minutes after swallowing. Injections can be used to give strong pain medicines, and are sometimes used during labour and in special instances. Patient controlled analgesia (PCA) allows you to have control over your own pain relief. When you feel uncomfortable you press a button that is attached to a PCA pump. The pump injects a small dose of the medicine into an intravenous (IV) cannula inserted in your vein. You should press the PCA button when your pain starts to become uncomfortable; do not wait for the pain to become severe. Epidural analgesia and patient controlled epidural analgesia (PCEA) are pain medicines given through a small tube placed in your back. They are often a mixture of local anaesthetic and an opioid. Epidural analgesia can be used to treat pain following surgery and for pain relief during labour. The function of a PCEA is similar to that of PCA. It’s very important that you tell the nurse/ midwife or doctor if you have taken your pain medicine and the pain does not go away. At different times during the day you may require more pain medicine to provide adequate pain relief; for example, when performing your physiotherapy exercises or showering. If you have had all the pain medicines that have been prescribed and you are still feeling sore, then you should ask to be seen by your doctor. To help with your recovery after surgery or giving birth, staff will encourage you to move regularly and as soon as possible. In hospital, if you need help moving, we will use a program called Smart Move, Smart Lift to ensure staff are safe and avoid risk of injury. There may be specialist equipment that is used to assist you with your movement. The staff will explain the workings of any equipment that is required to assist you to move. During your stay in hospital, a nurse or midwife will regularly assess your ability to sit in bed, stand and walk. Sometimes a physiotherapist will complete the assessment. The assessment will be included in your clinical notes. As a patient you have a higher risk of falls. There are a number of ways to avoid falls. Always wear supportive, flat, non-slip shoes or slippers (don’t walk in socks or stockings). Bring your eyeglasses, walking aids and appropriate footwear to the hospital and use them when walking. Get to know the room and area you are in. Let staff know if there are things on the floor in your way, or if a spill occurs. Make sure you can reach your call button easily. At night, turn your light on before getting out of bed. Take your time getting up from a chair or out of bed. The following information is particularly for patients who have recently given birth, had an epidural or spinal anaesthetic, must spend long periods in bed, or have lost a lot of blood. Check with your nurse or midwife before getting out of bed. Ask staff to help you when you get out of bed. When you have a shower, use a shower chair to sit on. After an epidural or a spinal anaesthetic, wait until you have full leg sensation and strength before trying to stand or walk. Let staff know if you are feeling unsteady on your feet. Put your baby to sleep on their back in their cot next to your bed. Keep a constant eye on your baby when they are on a surface such as a change table or bed. Put your baby in their cot if you are sleepy or you have taken strong medication for pain relief. If you fall asleep holding your baby they can fall from your arms. Advice for family or visitors. If your relative or friend is confused, stay with them as much as possible. Let a staff member know when you leave. A pressure injury, also known as a bed sore or ulcer, can form when you spend a long time sitting or lying in the same position. The risk of a pressure injury increases if you have to stay in bed or a chair, have limited sensation or circulation, or you’re not eating well. Having an epidural may also increase the risk of a pressure injury. If you notice any signs of pressure injury, tell your doctor, nurse or midwife immediately. Whether you are lying in bed or sitting in a chair, keeping active and changing your position frequently is the best way of avoiding a pressure injury. If you are unable to move yourself, the staff will help you change your position regularly. Special equipment such as air mattresses, cushions and booties may be used to reduce the pressure in particular places. Keep your skin and bedding dry. Let staff know if your clothes or bedding are damp. Tell staff if you have any tenderness or soreness over a bony area or if you notice any reddened, blistered or broken skin. Avoid massaging your skin over bony parts of the body. Use a mild soap and moisturise dry skin. The hospital has Aboriginal and Torres Strait Islander (ATSI) Hospital Liaison Officers to work with Aboriginal patients, families, community members and staff. The ATSI Liaison Officers are based at Parkville and can be contacted on (03) 9076 5387 or 0419 592 207. At the Hospital, Pastoral Care is available to all patients and their families irrespective of culture or religion. Should you wish to see your own Chaplain or Pastoral Care worker, please ask the staff caring for you. Accommodation: Patient and Family Services can provide information on accommodation options for consumers from rural and regional areas. Patient and Family Services can be contacted on (03) 9076 1292. ATM: located near the Emergency Department entrance. Kiosks and cafeteria: Sandringham Hospital’s kiosk is open daily from 11.00am to 7.00pm and is staffed by volunteers. The kiosk sells food and drinks, magazines, hand-knitted garments, cards, confectionery and various toiletry items. Newsagency: Newspapers are available in the vending machine near the entrance of the Emergency Department. Newspapers, magazines and some toiletries are available for purchase from volunteers at your bedside Monday to Friday mornings. an appointment to return to the clinic for a check-up, (usually in six weeks unless the doctor wants to see you earlier). If an appointment is not made at the time of your discharge, it will be sent out to you in the mail. a medical certificate if you need one. Some women will also be given a letter for their GP. The time it takes to recover from a major operation is different for each person. We expect that it will take between six and eight weeks. sudden onset of pain that is not relieved by over-the-counter painkillers. If you experience any of these symptoms, or if there are any other aspects of your health you are worried about, please see your local doctor or come to the Emergency Department at Sandringham. Relevant information about your medical condition will be forwarded to your GP or specialist and to community health workers and service providers involved in your care, unless you tell us that this should not happen. If you usually receive community services at home, please make sure health service staff know you receive this help. Attend a hospital emergency department. For urgent assistance, call 000. The Women’s offers a range of health information on this website in English and other community languages. You can also ask your midwife or nurse if there is written information available that will help you to know about your condition or treatment. Women’s Welcome Centre is on the Ground floor of the Women’s at Parkville. It has a large collection of women’s health resources. Become a member of the library to borrow books and DVDs. There is also a range of brochures and fact sheets in a number of languages available free of charge. Drop in, telephone or email the Centre (see contact information on this page).